Growth in Japan’s compensation of employees hit a 20+ year high. Spending on durable goods and services also hit new highs. Yet, more focus is needed on three threats to Japan’s export engine and household health. Growth in Compensation of Employees (COE) is the highest in over two decades – since before the “Asian Flu” hit Japan in 1Q1997. 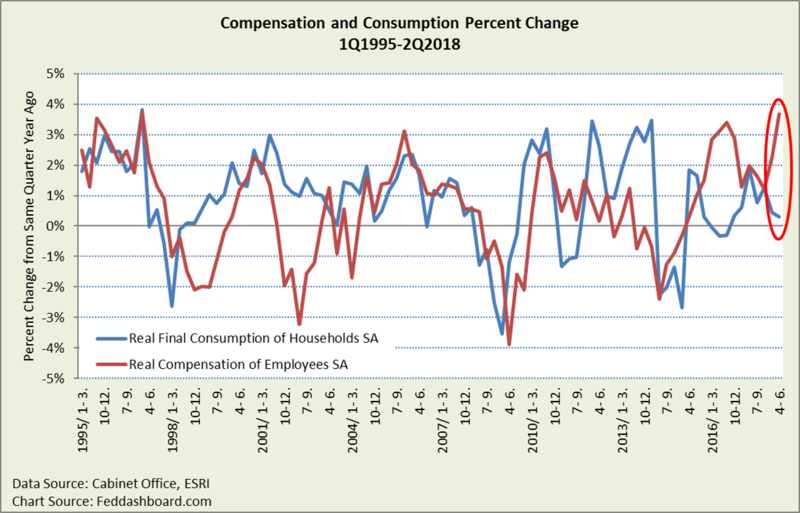 We’ve known that since about 3Q2015 companies have been increasing payouts, although COE includes benefit contributions beyond immediately spendable cash. And, wage growth is shifting toward younger workers as seniority increases moderate. A hope is that rising wages for younger workers will lead to marriages and babies. Shoppers have shown remarkable strength where it matters most – in largely discretionary durable goods since they rebounded in 2001 from the Asian Flu. In 2Q2018, shoppers rebounded from a weak 1Q2017 to a historic high in durable goods. Services spending also rose to a new high. Yet, shoppers also showed restraint in semi-durables (such as clothing) and nondurables (such as food and energy). Bad news: Purchases of semi- and nondurables haven’t recovered to their 4Q2013 levels, prior to the shopping spree before the Value-Added Tax (VAT) increased 1 April 2014. By contrast, services recovered to the pre-VAT increase level in 1Q2015 and durables in 3Q2017. In a myth that won’t die, the so-called Japanese “malaise” is not primarily about the individual shopper; it is more about demographics. In population, since the Asian Flu recovery in 2001, Japan’s population has fallen by 0.1%. By contrast, the U.S. has grown by over 13%. Private nonresidential investment is shaped by falling costs of productive equipment. Global competition constrains margin growth. Recall, tech grows output measured in units but constrains output measured in currency. Think about mobile phones. At the extreme, this is the vanishing GDP problem. 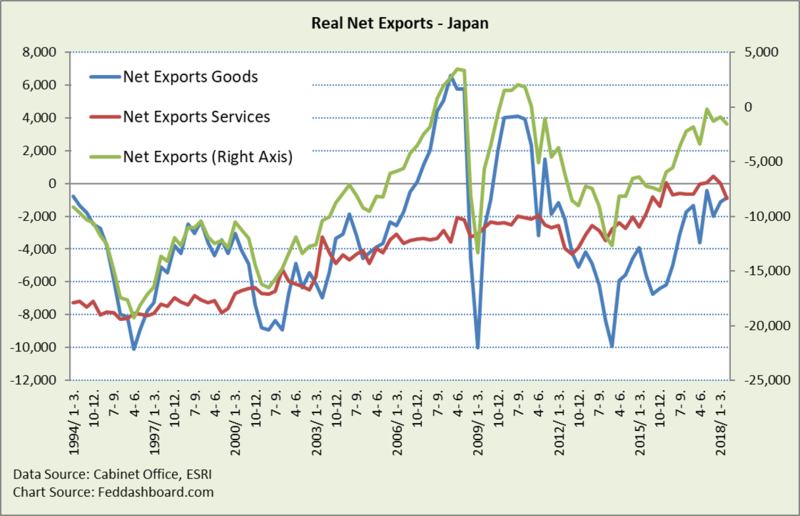 What moved the needle in net exports? A boost in net exports of goods. That came from an upswing in exports of goods in 3Q2016 more than a change in imports. Vitally, automation and improvement in management continue to cut cost. Yet, the spark of innovation isn’t as robust as in the past. Rising to the challenge, private sector improvements have been supported by the Government’s structural, corporate governance, and innovation initiatives, including the Government’s July 2017 new medical device approval process. Good news. Imports are costlier to manufacturers and consumers. A weaker exchange rate imports inflation – if shoppers cut purchases, then GDP growth slows. Nonfinancial companies seeking to hedge are confronted by the usual need to guess goods and services trade. Since 2010, they need to better guess financial markets seeking safety in the Yen and the actions of central banks. Corporate treasury decisions are confounded by the Bank of Japan (BOJ) diverging from other central banks and disconnecting from Cabinet Office and financial market data. Meanwhile, prices continue their fall because of lower production costs, online shopping, global trade, and the Government’s structural reforms. Axes are unequal to zoom in on detail. Durables begins with a price index of 314 in 1994. 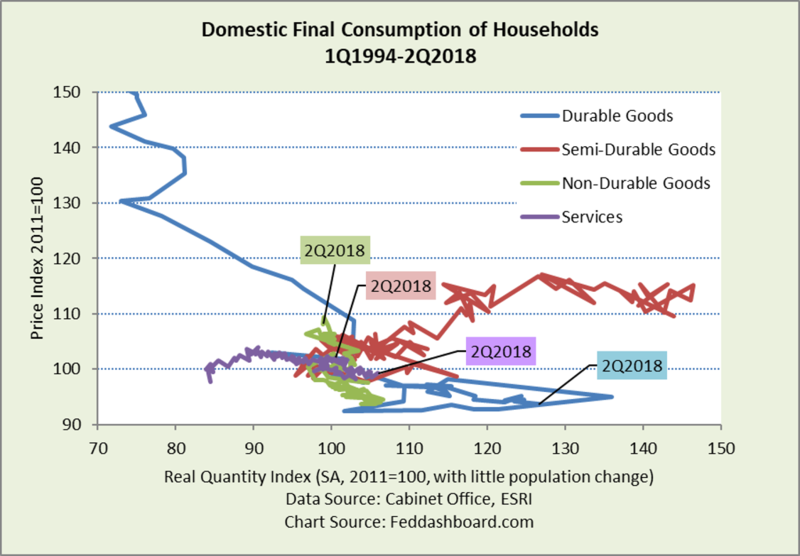 Importantly, the 2Q2018 data points of the four categories also form a downward-sloping curve – shoppers buy more when prices fall. Good are policy initiatives to encourage babies, women at work, innovation, and corporate governance and structural reforms to cut cost and improve resource flexibility. Acting now to harmonize policy can help Japan more easily achieve domestic objectives and strengthen its ability to project global stability as the largest market economy in Asia. 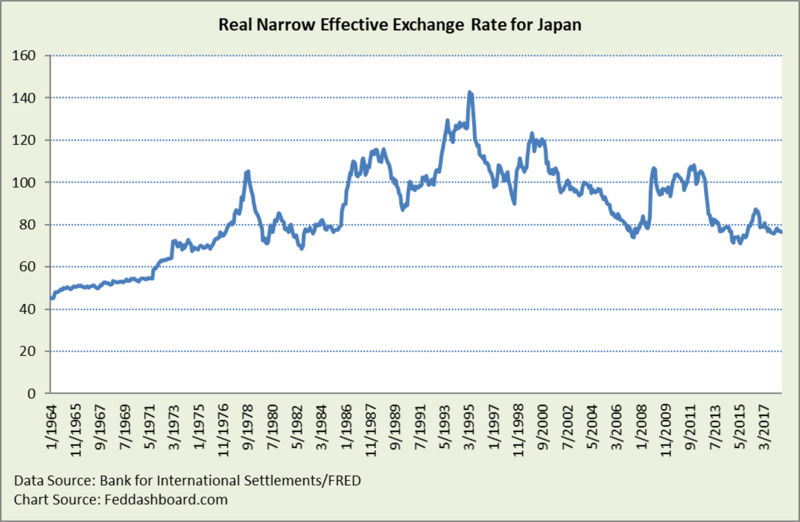 The “narrow” exchange rate with top trading partners is shown because it is a longer time-series than the “broad” rate. For more information see https://www.bis.org/statistics/eer.htm.